If you’re like most people, you are surrounded by wood in your home. Floors, furniture and even homes themselves are usually built, at least in part, with wood. You probably think this is a good thing because wood is more aesthetically pleasing and “natural” than synthetic materials like plastic and metal. However, “natural” isn’t always healthier. Wood is a magnet for mold and preventing mold growth requires constant care and maintenance. 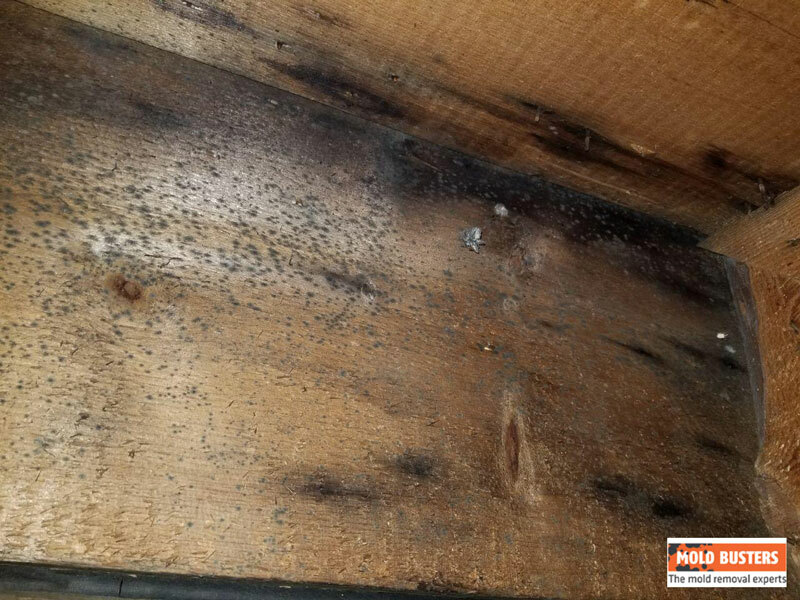 Our mold remediation experts have compiled everything you need to know about mold on wood and how to remove it safely and properly. Let’s get started! 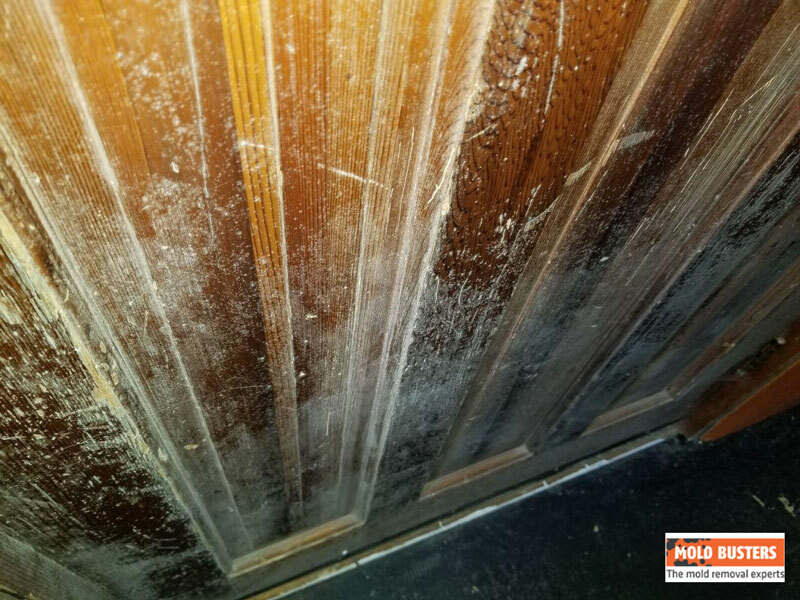 What are the causes of mold on wood? Whenever moisture, warmth and a food source (organic materials such as wood, paper, plants) are present, mold can thrive. Unfortunately, people tend to thrive in similar conditions: we surround ourselves with food, paper and other organic material; we fill our homes with moisture from showers and baths; and finally, we keep our homes constantly warm. 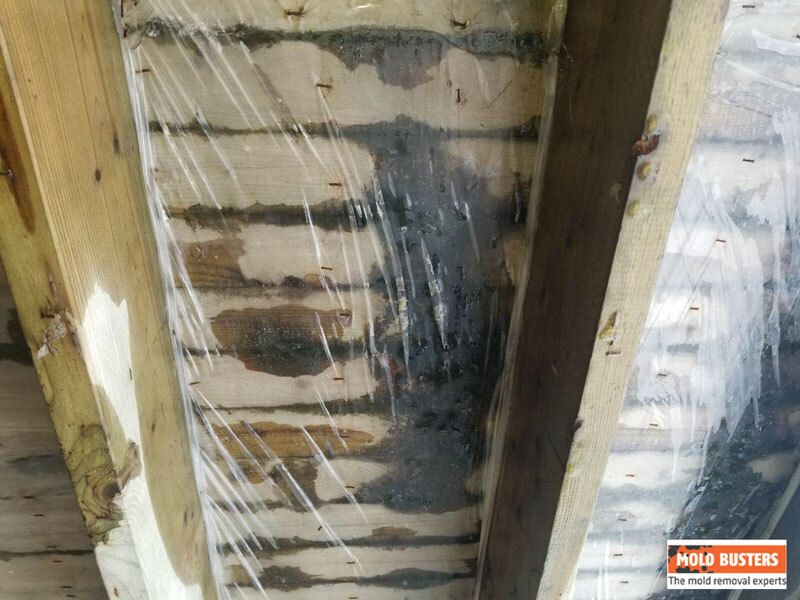 As if this wasn’t already bad enough, mold growth is further encouraged by modern building methods, such as light-frame construction, which uses cheap wood to form nearly every structural component of a home. Within every wall in these homes are dozens of wood beams, a feast for several common strains of mold. 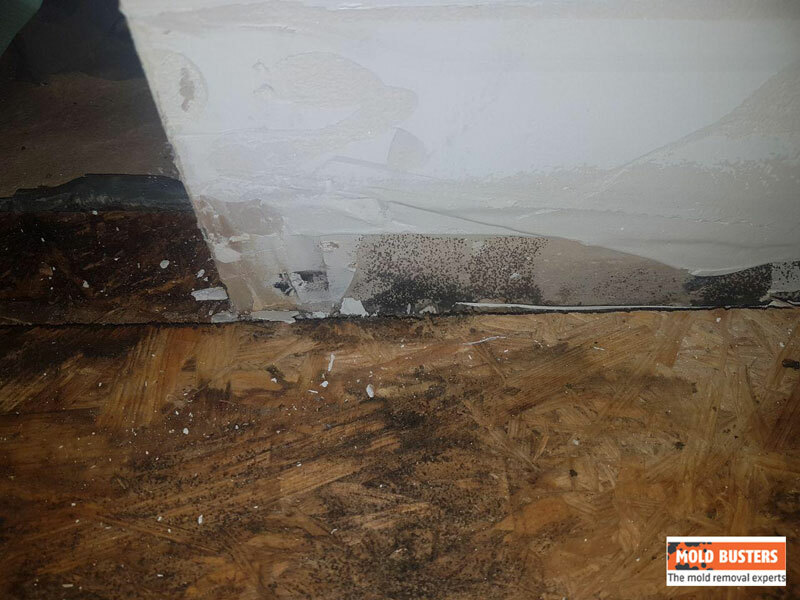 Construction companies try to prevent mold growth by using plastic film as a vapour barrier, but in practice, these barriers rarely do anything other than trap moisture inside walls, accelerating mold growth. Light-frame construction isn’t the only trend encouraging mold growth. Increasing pressure to make houses more energy-efficient reduces circulation between indoor and outdoor air. While older construction methods, such as brick and mortar, constantly expel moisture through porous walls, modern homes trap moisture indoors. This trend may reduce energy bills but it drastically increases the frequency and speed of mold growth. What are the dangers of mold on wood? Mold growth on wood poses many of the same risks as mold growth on any other food source. Spores fill household air and are inhaled by inhabitants, causing headaches, fatigue, allergies, asthmatic reactions, some forms of cancer and even life-treatening infections. However, mold on wood poses other risks in addition to these direct mold health risks. 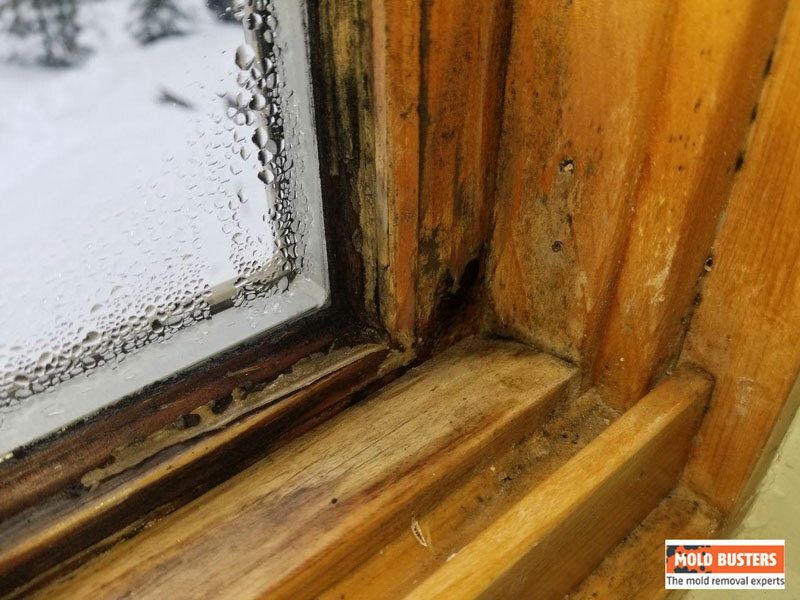 If it progresses far enough, mold growth can eat away at wood framing to the point that it weakens and threatens the structural integrity of your home. You’ve probably seen more than a few neglected roadside barns with bowed rooves and bulging walls. 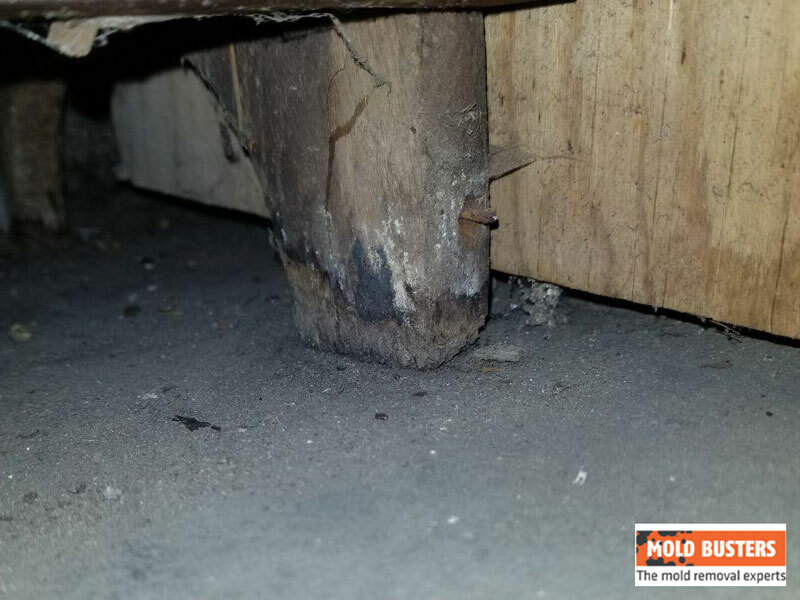 In these cases, structural wood has become so infested with mold that it sags under its own weight. The same thing can happen in your home if you’re not careful. How can you identify mold on wood? 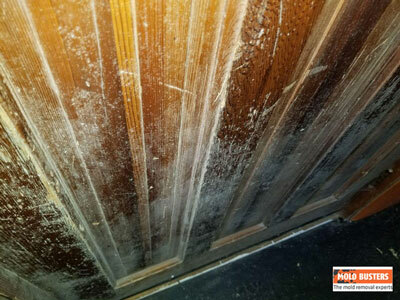 Mold on wood is very common but also very often overlooked. 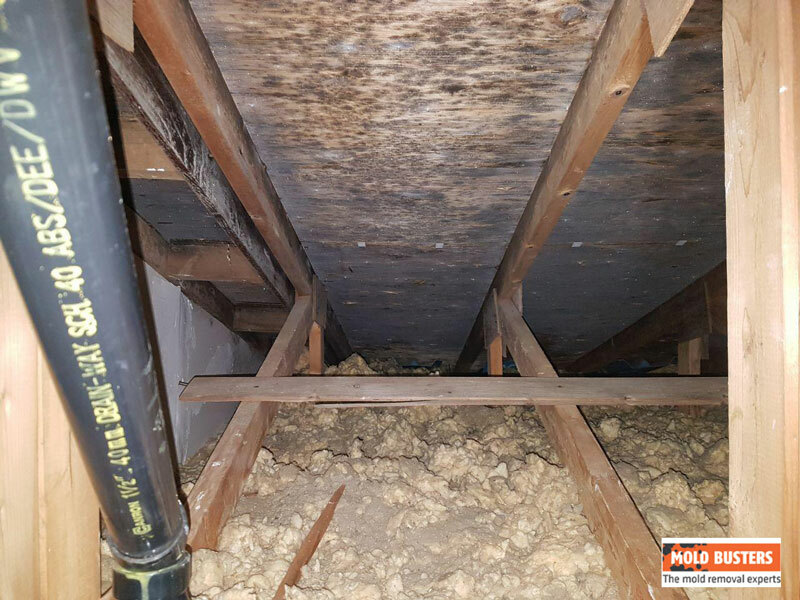 Most wood in homes is hidden within walls (structural beams), so mold can grow for a long period of time before it is noticed. And even for wood that is readily visible, black spots or streaks may be mistaken as part of the grain of the wood. 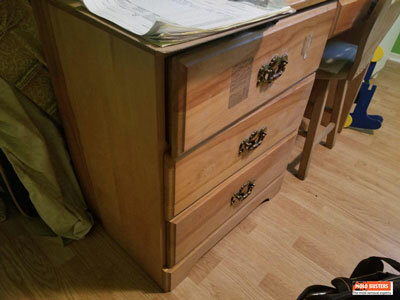 All household wood should be inspected for mold but unfortunately, as cheap particle board furniture becomes more and more popular, many people are becoming complacent about the risk of mold growth. Just because a piece of furniture isn’t made of “real wood”, this doesn’t mean it’s safe from mold. Particle board is wood, just wood that has been broken into small particles and reassembled using glue. 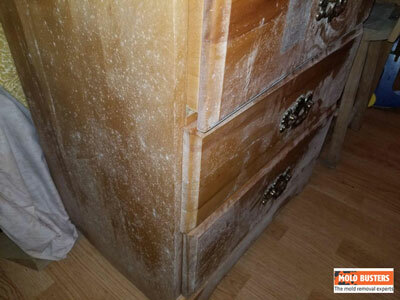 The small flecks and scraps of wood inside particle board are just as vulnerable to mold growth as genuine wood furniture. So don’t overlook your particle board furniture. Inspect it for signs of mold growth just the same as you do with wood furniture. One way to identify surface mold on wood is to photograph the same area several times over the course of a few weeks. 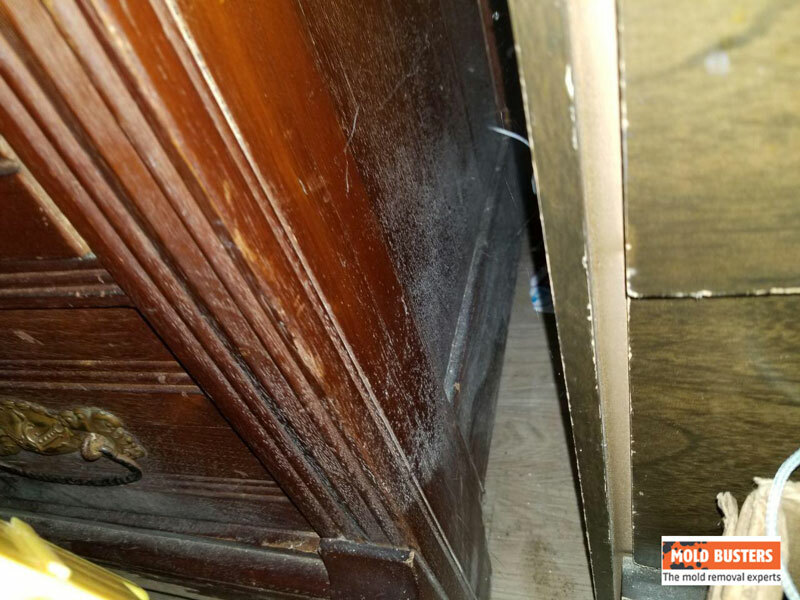 If dark or light streaks change in shape or size, this is no just the grain — this wood is infested with mold. Unfortunately, identifying mold within walls is almost impossible to do visually (unless you want to rip into your walls, of course). 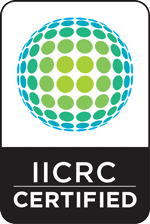 However, qualified mold inspectors employ a variety of mold inspection techniques to find hidden mold. Mold produces heat, so infrared scanning can reveal mold hidden within walls. Air testing can also identify airborne mold spores and a skilled inspector may be able to track these spores back to their source in the wall. 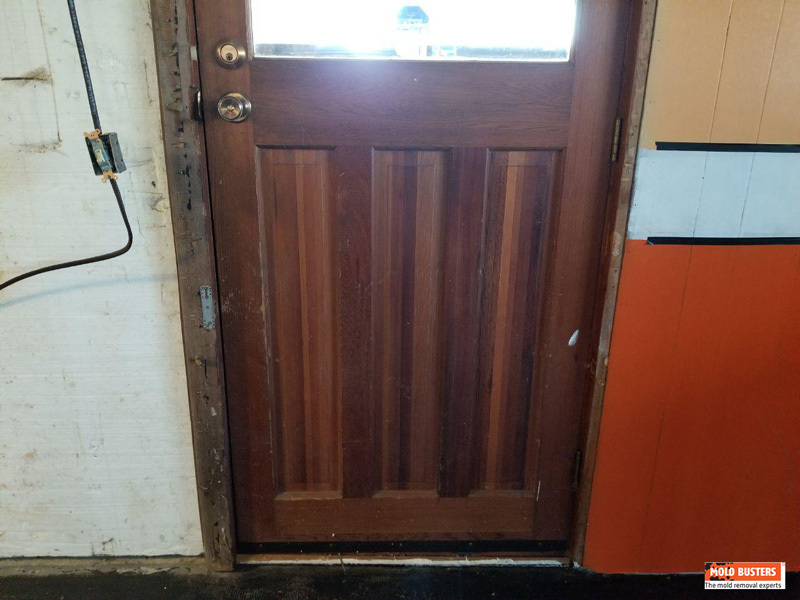 How can you get rid of mold on wood? If you notice mold on wood in your home, there are a variety of ways to get rid of it. Many household products (e.g., bleach, dish soap, vinegar) are effective at killing and cleaning up small colonies of mold. Chemical treatments are available as well and, in most cases, will be more aggressive and effective than household cleaning products. However, some mold-killing chemicals are corrosive or otherwise damaging to wood. Before applying harsh chemicals to wood in your home, make sure that these chemical won’t damage the appearance or structural integrity of the wood. Once you’ve chosen your mold-killing cleaner, you’re ready to apply. Wear gloves to protect your skin from the cleaner. 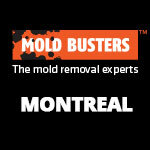 Scrubbing mold will release spores into the air, so use a respirator to protect your lungs. Cleaning up a mold colony is a good idea, but there are many limitations to do-it-yourself solutions. 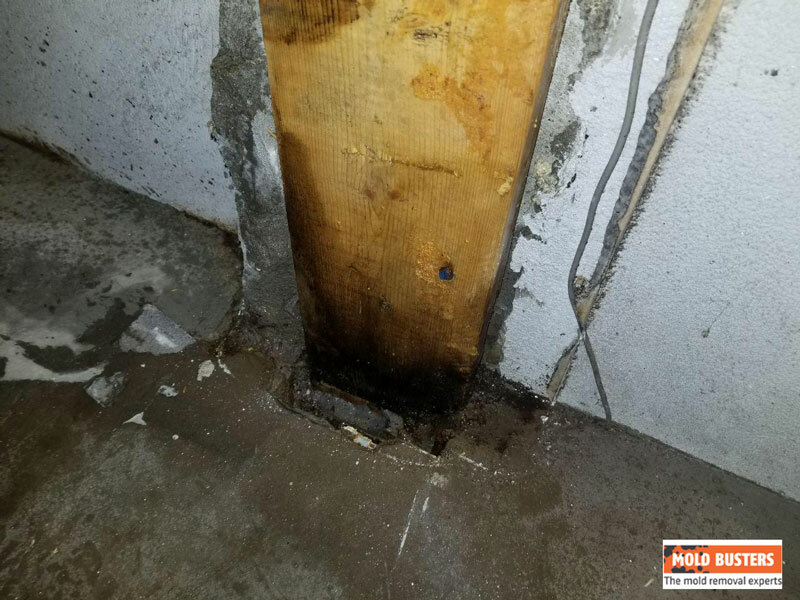 Wood is porous and mold can burrow deep below the surface, so even if you have eliminated all visible surface mold, significant amounts of mold may still lie hidden below the surface. And even though mold may be hidden, it can still negatively affect indoor air quality by spreading mold spores. Another limitation of cleaning up surface mold is that it is rarely more than a temporary solution. 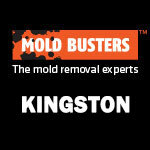 Simply cleaning up mold doesn’t address the root causes of mold growth,. You may clean up a mold colony one day and come back a week later to find that it has grown back. In cases like this, you could be experiencing an unseen leak or moisture buildup from a ventilation problem. The only way to fix these problems is to have a qualified mold professional inspect your home and identify the source of the problem. 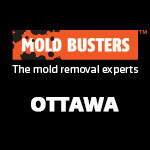 Health Canada recommends that you only tackle mold colonies of up to 10 square feet on your own. 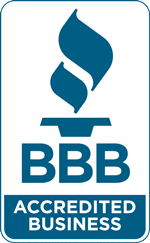 Beyond that, the risks of cleanup far outweigh the benefits and you will be better off hiring mold remediation professionals, who have the equipment and knowledge needed to remove mold effectively and safely. 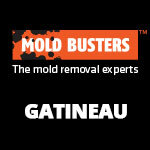 In some cases of advanced mold growth, removal of the wood may be the only option. If the wood in question is a piece of furniture, then this may not be such a serious problem. However, if the wood in question is part of your house, then this could be difficult to remedy. The wood may be difficult to access and could require some demolition (e.g., removing drywall). Or, the infested wood could be load-bearing, in which case you should consult an engineer on removal. 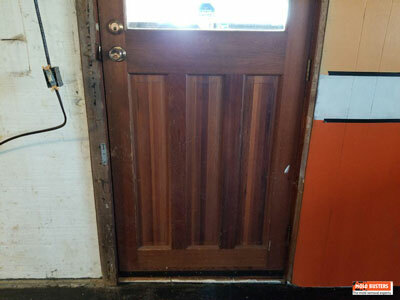 How can you prevent mold gowth on wood? Where possible, use mold-resistant wood like cedar for construction projects, especially outdoor projects like fences and decks, which will be exposed to moisture on a regular basis. Never allow wood to be exposed for extended periods of time. If the finish has been rubbed off, replace it before mold can take root. Most people believe that they are safe from mold growth so long as their homes don’t have any serious cracks or leaks. However, all homes have humidity, moisture and certain areas that are vulnerable to mold growth. And modern homes are designed in ways that encourage mold growth, even in ideal conditions where cracks, leaks and holes aren’t present.